Given an array arr of N non-negative integers representing height of blocks at index i as Ai where the width of each block is 1. Compute how much water can be trapped in between blocks after raining. We can trap 2 units of water in the middle gap. The first line of input contains an integer T denoting the number of test cases. The description of T test cases follows. Each test case contains an integer N denoting the size of the array, followed by N space separated numbers to be stored in array. Output the total unit of water trapped in between the blocks. 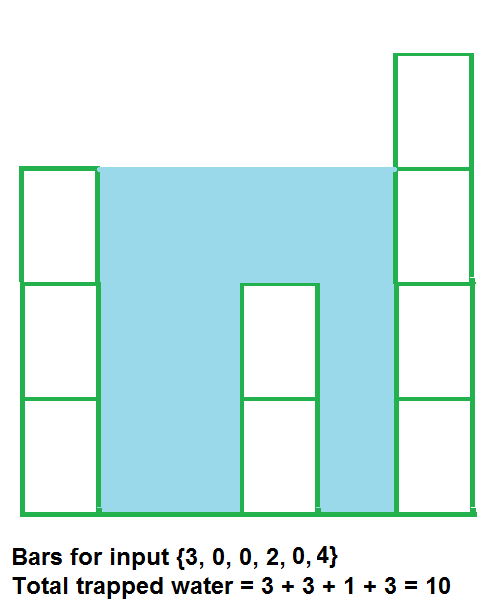 Testcase 1: Water trapped by block of height 4 is 3 units, block of height 0 is 7 units. So, total unit of water trapped is 10 units.